Preheat the oven to 200°C. 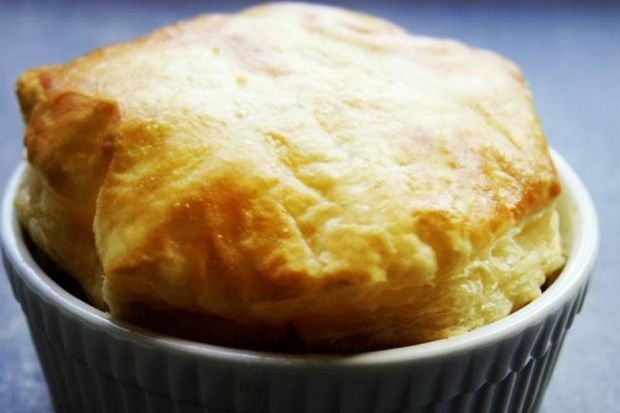 Place 6 individual ramekins (180ml-240ml size) on a baking sheet. Set aside. In a saucepan, melt the butter. Add the onion and sauté until it is just turning golden. Sprinkle in the 2 tablespoons of flour and cook 1 minute. Whisk in the broth and milk. Cook on medium heat, whisking constantly, until mixture has thickened. Add the peas and carrots, chicken, thyme, seasoning blend, salt and black pepper to taste. Cook about 5 minutes. If mixture is too thin, scoop out some of the liquid into a small bowl and mix in the remaining 1 tablespoon of flour. Stir the flour mixture back into the saucepan and heat a few more minutes to thicken. Divide the mixture into the ramekins. Cut out puff pastry rounds to just fit over the filling. Brush the top with egg wash.
Bake 15 to 20 minutes or until pastry round is puffed and golden brown, and the filling is bubbly.